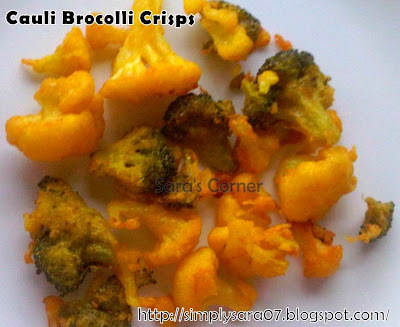 Cauli Brocolli crisps /pakoras are very tasty and different. Usually we make cauliflower bajji or pakoras. Adding brocolli made my son eat this veggie too and glad he liked it. Kesari/Orange colour a pinch - Optional. Make small florets of the veggie. Put them in boiling water with little salt and a pinch of turmeric for 10minutes. Close with a lid. leave it for sometime. Drain/Strain fully so no water is left. Transfer it to a wide bowl. Sprinkle Arasi, Chola and Kadalai maav all over and mix well. Add chilli powder and salt. Sprinkle very little water and mix well. Deep fry in oil until brown and crispy. Tasty Cauli Brocolli crisps are ready. This can be had at tea/coffee time at home or office. Never tried with broccoli,both together makes awesome combo! Broccoli pakoras are really new to me Sara..but its a wonderful idea..this will make a great tea time snack. Yummies crispies for an evening snack:) love it..
Yummy crispy beauties, feel like munching some.. Very innovative and delicious recipe. looks awesome !! Looks absolutely perfect and delicious.. awesome clicks !!.. Nevr tried out brocolli fritters...Looks too yumm!!! Got to try this soon!! Yum, looks superb and so tempting. Nice and healthy snack !! Thanks for visiting my blog and your lovely comments. Wow, simply amazing. Delicious snack! Wonderful recipe, I tried it at home, its taste was amazing. Thanks for trying and glad you like it @ Endless.